Can cryptocurrency networks govern themselves? Last week’s dramatic price decline across the cryptocurrency market has reignited an old debate—are networks like bitcoin inherently ungovernable? On November 15 bitcoin cash (BCH), itself only a year-old offshoot of bitcoin (BTC), fragmented into two new chains: BCH ABC and BCH SV. The acrimonious split in bitcoin cash helped trigger a week-long downdraft in cryptocurrency prices. At 06.30 GMT on November 21, 7-day declines in cryptocurrencies’ US dollar exchange rates ranged from -29% (EOS) to -31% (BTC), -36% (LTC), -37% (ETH), -40% (BCH SV) and -54% (BCH ABC). These price drops brought a savage, nearly year-old bear market to new lows. At a headline level, the latest fork is a continuation of last year’s battle over the ability of bitcoin to function as a payments network. When splintering BCH from BTC last year, the supporters of bitcoin cash promoted an increase in the cryptocurrency’s block size from one megabyte (MB), a limit set by Satoshi Nakamoto in 2010, to eight MB. Increasing the block size allows the storage of more transaction data, reducing transaction fees and making BCH more suitable as a means of payment. However, a policy of block size inflation threatens the long-term decentralisation of the bitcoin network. As a result, the bitcoin chain with the highest market value (BTC) has stuck with Satoshi Nakamoto’s one MB block limit. Bitcoin cash’s latest fork involves a further inflation of block sizes: to 32MB (in BCH ABC) and 128MB (in BCH SV), as well as other, more technical modifications to each network. But, perhaps most damaging for cryptocurrency market sentiment, the fork has also involved a very public airing of dirty laundry by two of the most outspoken and controversial figures in the bitcoin community. The most prominent public supporter of the BCH ABC camp, Roger Ver, is an early investor in bitcoin and bitcoin start-ups, the owner of the bitcoin.com website, a multimillionaire and a former convict (Ver was sentenced to jail in the US in 2002 for selling explosives on eBay without a licence). In the fight over the future of bitcoin cash, Ver had the backing of Jihan Wu, the co-founder of prominent cryptocurrency miner and hardware manufacturer Bitmain. The BCH SV (‘Satoshi’s Vision’) camp is led by Craig Wright, who achieved notoriety in 2016 after claiming to be the inventor of bitcoin, Satoshi Nakamoto. After hoodwinking some of the audience, Wright failed to provide the cryptographic proof he had promised. According to journalist Andrew O’Hagan, writing in the London Review of Books in 2016, Wright is also a fugitive from the Australian tax authorities. In the bitcoin cash fork, Wright was backed by Calvin Ayre, an online gambling billionaire, convicted criminal and citizen of Antigua and Barbuda, where he advises the government on cryptocurrencies. During the weeks preceding the BCH split, Ver and Wright traded insults, with Wright claiming he could sabotage Ver’s network. Some cryptocurrency market participants have already moved to anoint one half of the split as the rightful heir to the bitcoin cash name and network. For example, cryptocurrency exchanges Kraken and Huobi both decided this week to award the BCH ticker to the ABC fork. They renamed BCH SV as BSV on their trading platforms, downplaying the new chain’s past association with bitcoin cash. And Swiss cryptocurrency asset manager Amun, whose exchange-traded product (ETP) launch has coincided with the fork, has decided to track an index that includes only the ABC branch of bitcoin cash. “What really mattered in the bitcoin cash fork was the exercise of soft power to convince exchanges to list either of BCH ABC or BCH SV as BCH,” Nic Carter, partner at Castle Island Ventures, told New Money Review. “It looks like ABC won the ‘rights’ to the ticker. This is unsurprising as they had the most community and corporate backing within the BCH network,” said Carter. According to Carter, some of the cryptocurrency miners backing the traditional bitcoin (BTC) network have also influenced the outcome of the BCH network split, often in a less-than-transparent way. “We saw lots of BTC hash power being redirected to BCH, at times without the permission of the allocators,” said Carter. 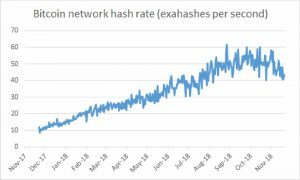 Since the beginning of November the BTC hashrate has fallen from 60 exahashes per second to around 40 exahashes, the first significant decline in a year (an exahash is a billion billion hashes). The number of hashes reflects the processing power devoted by bitcoin miners to the network. However, the bitcoin network hash rate is still four times higher than a year ago, despite the ongoing bear market in cryptocurrency prices. Carter sees the apparent recent diversion of BTC mining activity to BCH as symptomatic of a broader governance problem. “Mining pool operators are totally unaccountable, and happy to exploit the power that they have for political objectives. This is questionable at best. The cowboy industry of mining pool operation definitely deserves more scrutiny, and this should raise support for initiatives like BetterHash,” he said. BetterHash aims to decentralise bitcoin mining by removing the undue influence of some operators with ‘pools’ of computers under their control. And, says Carter, the apparent winners of the bitcoin cash battle—those promoting BCH ABC—had to compromise significantly on the key selling point of bitcoin, decentralisation, to achieve their political objectives. “I think this was a pyrrhic victory for BCH ABC,” Carter told New Money Review. A checkpoint, achieved by a manual alteration to a cryptocurrency’s code, helps prevent a network against an attack: it stops a potential adversary from mining coins in secret and then disclosing a new ‘longest-chain’ history, effectively taking over the network. Last week’s events have triggered a renewed bout of soul-searching over cryptocurrency governance. For some, the much-vaunted decentralisation of bitcoin is a myth. “Bitcoin is always labelled as decentralised and distributed,” said Ruth Wandhöfer, head of industry and regulatory affairs at Coinfirm, speaking last week in London. Wandhöfer was formerly global head of regulatory and market strategy at US bank Citi. “Bitcoin is distributed in terms of the number of computers around the world running the protocol,” said Wandhöfer. “By contrast, centralised networks that do have governance—like SWIFT, a central bank or a financial market infrastructure—work very well,” said Wandhöfer. In September, a software flaw that would have allowed the expansion of bitcoin’s 21 million coin supply limit was unearthed and then quietly fixed before being disclosed to the wider network. Others insist that cryptocurrencies represent a new form of socioeconomic collaboration, with its own evolving ruleset. “I’m not sure that this kind of governance has ever existed,” Obi Nwosu, chief executive of cryptocurrency exchange Coinfloor, told New Money Review. “Bitcoin is not a democracy, but it’s not an autocracy either,” said Nwosu. Nwosu said that, to succeed, individual cryptocurrencies will need to maintain the support of different interest groups. A website called Forkgen illustrates Nwosu’s point by allowing anyone to create their own version of bitcoin. Michel Rauchs, lead blockchain researcher at the University of Cambridge’s Centre for Alternative Finance, also emphasises the organic nature of cryptocurrencies’ evolution. “I often think of individual cryptocurrencies as something like individual countries or city states, each with its own social contract,” Rauchs told New Money Review. But the often public disputes that surround cryptocurrencies, and their uneven paths of development, may be inherent in these new networks, and something we’ll all have to get used to. “It’s not like state-issued fiat money, which is imposed via coercion,” Rauchs said. Bitcoin is an oligarchy, just as modern Western society. Because fundamentally, the consensus algorithm, whether applied in politics or computing, produces decentralized, but not distributed authority. The original, ancient Athenian democracy selected its leaders by random draw (“sortition”), not consensus–the two are completely different paradigms. For an example of a digital currency that uses purely a sortitive algorithm, rather than consensus, see the FreeMark by Worldfree. Hi Kevin, thanks for the comment, preventing a cryptocurrency (and any currency) regime from descending into an oligopoly seems like a serious challenge.